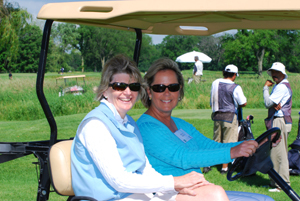 CHICAGO – The 49th Annual Children’s Memorial Pro Amateur Golf Championship will be held on Monday, June 29, 2009 at the Onwentsia Club in Lake Forest. The tournament, hosted by the Founders’ Board of Children’s Memorial Hospital, is the second oldest pro amateur golf tournament in the country. Presenting sponsors for the 2009 Pro Am are Huron Consulting Group and United Airlines. All money raised from the 2009 Pro Am tournament will support the Founders’ Board’s $10 million pledge to the hospital’s Department of Family Services. Last year’s Pro Am event netted a record $1 million for the hospital. to bid on one-of-a-kind auction items, including a 2010 Winter Olympics package, a one-week stay at a private home in Paradise Island and a five-day trip to the Dromoland Castle in Ireland. In addition, there are a number of golf getaways at some of the premier courses across the nation. Participants in this year’s Pro Am will play a round of golf with professionals from the most exclusive country clubs throughout the U.S. The day will conclude with the 19th Hole Awards Party, hosted by Forsythe Technology, Inc., Illinois Tool Works and NYSE/Euronext, at Onwentsia. Founders’ Board members Molly South and Robin Zafirovski, both of Lake Forest, are serving as co-chairs of the event and John Ferguson and John Derse, both of Lake Forest, are co-chairs of the Men’s Golf Committee. A limited number of individual playing spots are still available for this year’s Pro Am for $2,750. For information on participating, please contact Katie Spieth at 773-880-6307 or visit childrensmemorial.org/proam. Children’s Memorial Hospital, Chicago, is recognized as one of the top pediatric hospitals in the country by rankings published in U.S. News & World Report and serves as a major regional referral center. Its physicians are on the faculty at Northwestern University’s Feinberg School of Medicine. The hospital is currently engaged in the Heroes for Life campaign to raise a minimum of $600 million to help create Ann & Robert H. Lurie Children’s Hospital of Chicago and support its medical and nursing professionals, programs and research. As a not-for-profit organization, Children’s Memorial relies on philanthropy to help provide care to 126,000 patients and their families every year.